Imagine Delicatessen without the slapstick. 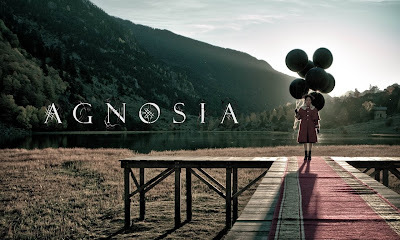 Add a bit of The Prestige and sprinkle with a dash of Romeo and Juliet, with just a few pinches of Jack the Ripper, and you might have an inkling about what Agnosia is about. This is a film that is hard to define, and that is exactly its strength. Don't be fooled by the period piece setting, for beneath it's cape hides a dragon of a movie. Part love story, part steampunk, part thriller and part historical drama; the screenplay always keeps you guessing as the web spins ever wider. And while you're trying to figure out what the heck it is you're watching, you're being dragged in ever deeper, into a magical world which you never thought you'd care about, but suddenly feel utterly addicted to. The acting, soundtrack, artwork and especially the cinematography all cooperate perfectly to create the most mind-boggling universe, where there's more to take in, than a single viewing can handle. I shouldn't oversell it, but to be honest, the best way I can think to describe it, is a Blade Runner set somewhere around the 1900 mark. Agnosia will be most appreciated with a chilled bottle of red wine. Spanish, of course. This was not a film. This was an epic novel. Brilliant.